Your Aussie Clean Sweep is designed to function on all surfaces i.e. Synthetic Grass, Porous, Clay, Loam, Gravel, Plexi-Pave, Rebound Ace, Asphalt, etc. 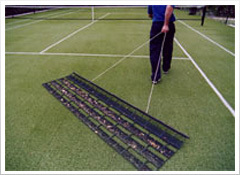 There are some minor variations in technique dependant upon the type of surface and debris, however the following basic instructions apply to all courts. As with tennis — practice makes perfect. To remove leaves and other debris, make sure your Aussie Clean Sweep is right side up and simply pull it BRISKLY over the court. It is more efficient to start in the areas of least debris and finish in areas of most. To remove leaves etc. collected on the Aussie Clean Sweep, hold the bar and shake debris into a heap at a suitable disposable point (garden, gate etc) If there are a lot of leaves do small sections at a time and shake off leaves often. You may have to cover the court several times, alternating the direction of travel each time. Do not worry that the front row of the Aussie Clean Sweep does not contact the court – it is not designed to do so. THE SECRET: Walk briskly and shake off often. To remove a heavy cover of pine needles, it may be advantageous to flip the Aussie Clean Sweep over to remove the majority and then finish in the usual way. For grooming the court under wet conditions it can be advantageous to use the Aussie Clean Sweep upside down. This helps prevent clogging. To remove aggregate that may have come to the surface from the sub strata of porous courts, or to remove coarse material prior to re-topping, draw the Aussie Clean Sweep from the centreline to the side of the court covering the same area several times. Once removed in this way any further stones that appear will be removed in the course of normal grooming. Your Aussie Clean Sweep is made of the best quality durable materials and should be left FLAT on the court ready for use. If it becomes kinked it will not function efficiently. However, leaving it flat in the sun or a suitable warm place can rectify this. We thank you for choosing our product and wish you enjoyable tennis . When first taken from the carton it may be necessary to lay the Aussie Clean Sweep right way up on a flat surface for up to 24 hours (less in mild to warm conditions). This allows for any distortions caused by folding and packaging to disperse and for the combs to adjust to a flat plane. Clean and groom your tennis court in 8.5 minutes with the Ultimate Tennis Court Sweeper by Aerosweep.